ARLINGTON, Texas -- Yu Darvish had a demonstrative show of emotion, pumping his fist and letting out a shout after ending the seventh inning with another strikeout and two runners on base. 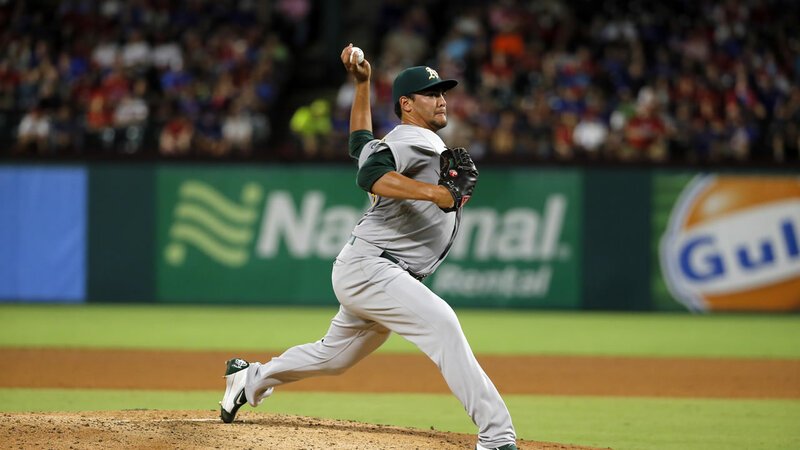 A day after his 30th birthday, the Texas Rangers right-hander finally ended his long personal losing streak to the AL West-rival Oakland Athletics - a team that until Wednesday night he had beaten only in his first start against them more than four years ago in his eighth major league game. Darvish struck out nine and walked only one as the Rangers won 6-2. He was 0-8 in his previous 10 starts against the only MLB opponent with more than three wins against him. "It's a different lineup. But like me, I change, too," Darvish said through his interpreter. "I feel just fortunate that I got a win." All-Star center fielder Ian Desmond and recently acquired Jonathan Lucroy each had three RBIs as the AL-best Rangers completed a three-game series sweep. Darvish (4-3) bounced off the mound after striking out Coco Crisp to end the seventh. "He's a very tough out. He doesn't strike out. He battles," Darvish said. "Mentally, I wanted on top of it and make sure I could strike him out." Crisp struck out three times after homering on the second pitch of the game. Jake Smolinski went deep leading off the fifth for the only other Oakland run. "The whole body of work for the night was special," manager Jeff Banister said. "To have Darvish utilize the slider ... the front to back, up to down with the fastball, and he was able to regulate the velocity of the fastball tonight from 91 to 97." Darvish came back for the eighth, but was pulled after Danny Valencia's leadoff double. The only win for Darvish against the A's was on May 16, 2012, early in his MLB career after the previous seven seasons in Japan. He had a no-decision against them three weeks ago in a season when he didn't make his first start for the Rangers until May 28 after missing all of 2015 following Tommy John surgery. "We want him to be healthy, because anytime he's healthy, we know what he can do," said Rangers shortstop Elvis Andrus, who had three hits and scored twice. Lucroy's homer in the fourth was his seventh in 15 games since being traded to Texas from Milwaukee on Aug. 1, and his career-high 20th overall for the season. He was behind the plate catching Darvish. "He was definitely fired up. He's usually pretty reserved emotionally," Lucroy said. "Look, it was a big game. You want to finish it off. You want to finish off the sweep there, obviously, against a division rival." Desmond had a two-run single in the fifth for a 3-2 lead against rookie lefty Sean Manaea (4-8), who is 1-4 in nine starts since the end of June. He gave up four runs and struck out five without a walk in six innings. "It just wasn't there today I guess. It just wasn't there. Just make better pitches," Manaea said. "It's pretty frustrating but there's nothing I can do about it now. I just have to move on."